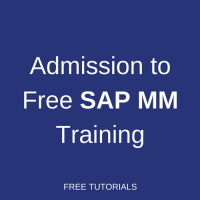 Here you can apply to join our free SAP MM Training course. This course is offered to everyone who is interested in learning SAP MM. There are no mandatory prerequisites for joining the course but some background in the supply chain area will be beneficial. We will send new lessons of the course to your email address every several days. Additionally, you will need to perform exercises and answer quizzes if you would like to receive a Statement of Accomplishment upon completion of the course.